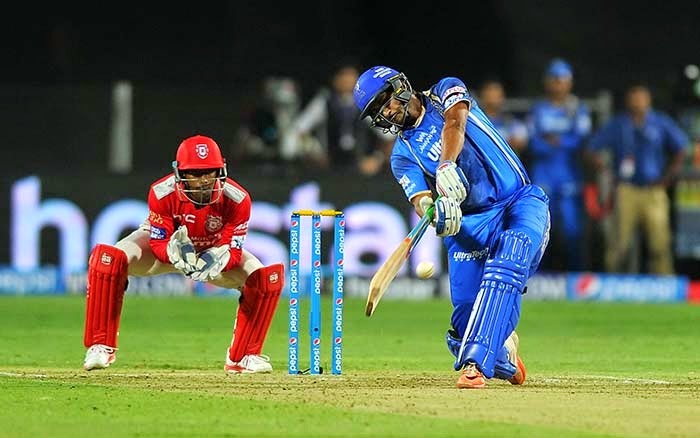 The third Match of the Indian Premier League, between two highly talented and equally potential teams, witnessed the Rajasthan Royals triumph over the Kings XI Punjab by 26 runs. The Kings XI who probably have a dream batting Iine up on paper, and have even chased scores of over 200 in the previous seasons failed to chase down a score of a modest but challenging 163. On the other hand the Royals, led by Steve Smith the stand-in captain for injured Shane Watson, produced a yet another match-winning bowling performance and ended up victorious. Winning the toss, the Punjab camp put their opponents to bat first and quite predictably on a green top at the stadium in Pune. The choice of bowling first favoured the Kings XI for the initial part of the game as the Royals were reduced to 14 for 2, in just three overs as both the openers in the form of Rahane and Samson were back in the pavilion. This jolt was just sinking in before Karun Nair too followed his team openers and his team was reeling at only a docile 35 runs for the loss of 3 wickets in 6 overs. Steve Smith was looking good and seemed to provide some stability to the initially brittle batting performance before his fellow Australian team mate and his opponent in this game, Mitchell Johnson won the much talked about contest between them, and sent back Smith for 31, leaving the Royals at 73-4 at the end of 10 overs. After this stumble it was Punjab's game all the way. Indian young gun Deepak Hooda thrashed the bowlers, scoring 30 off just 15 balls a long with James Faulkner who got out on 46 off merely 33 balls. The highlight of Faulkner's swash buckling innings was hitting his Aussie counterpart Johnson for 20 runs in the 19th over. Where scores around 120 were in doubts after half the team had returned for only 75 runs, these two capitalised on the last few overs helped their team to set up a challenging total of 162 on the board. Aruneet Singh was the pick of the Kings XI bowlers who grabbed 3 scalps for 23 runs in his quota of 4 overs. Mitchell Johnson who bagged two wickets looked extremely ferocious, as first nine of his deliveries failed to make contact with the batsman's bat and the the ball which finally did resulted in a wicket. Snadepp Sharma was the most economical bowler and picked up a wicket. Axar Patel too contributed one scalp but leaked away too many runs. Chasing a tough but gettable total of 163, the Kings XI received an early setback as Sehwag departed on the very first ball of the innings to a juicy outswinger from Southee which was well caught by acrobatic Samson. It wasn't too late before Saha too had to walk back for being run out by a direct throw from keeper Samson when the run wasn't on.Glenn Maxwell, who had enormous expectations of him because he had won his team many matches, also had a short stay at the crease as he got out for only 7 and he was followed by Murali Vijay who was looking in quite a decent touch was run out by Samson again as Punjab were 64-4 in just 9 overs. 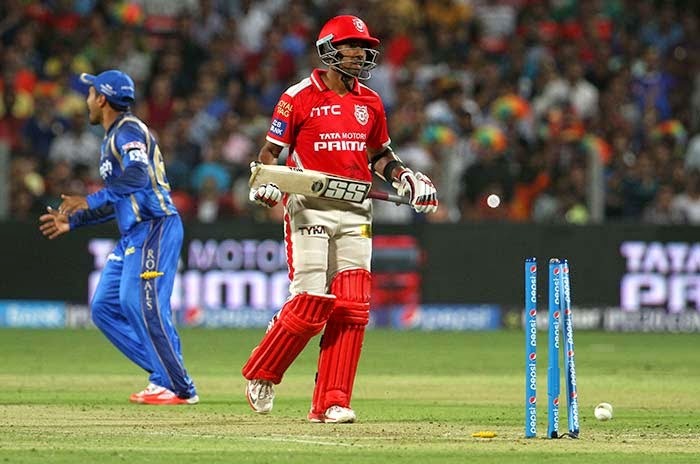 Saha had to depart as a result of an amazing direct hit from Sanju Samson. The experiment to keep back Killer Miller and Captain Bailey and send Axar Patel ahead of them failed terribly, as by the time the formers arrived on the crease, it was too late. Wickets kept on falling regularly although we saw some hits from Miller and the run and ball gap was way beyond gettable. Some controlled and stifling bowling from the Royals built up the scoreboard pressure and resulted in some airy shots from the batsman which turned fatal. Bailey raised faint hopes of creating a miracle before he was out to a ball by Faukner which was completed by a stunning relay catch of Tim Southee and Karun Nair.An unbelievable field action was put on display as Tim Southee and Karin Nair completed a dual catch to show the raise standards of fielding in recent times. James Faulkner was adjudged the man of the match for his marvelous show being the epicenter both with the bat and the ball as he ended up grabbing 3 important wickets. The strategy to shuffle the batting cost Punjab and now they will have to go back to their drawing board and sort out a plenty of things before their encounter with the Mumbai Indians on Sunday. They will have to transform their ominous side on paper to match winning display on field. 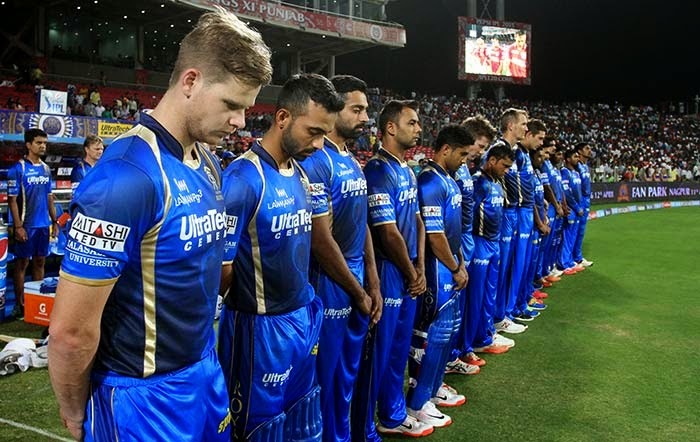 As for the Royals, they will be up beat before they face the Delhi Daredevils in their next match. 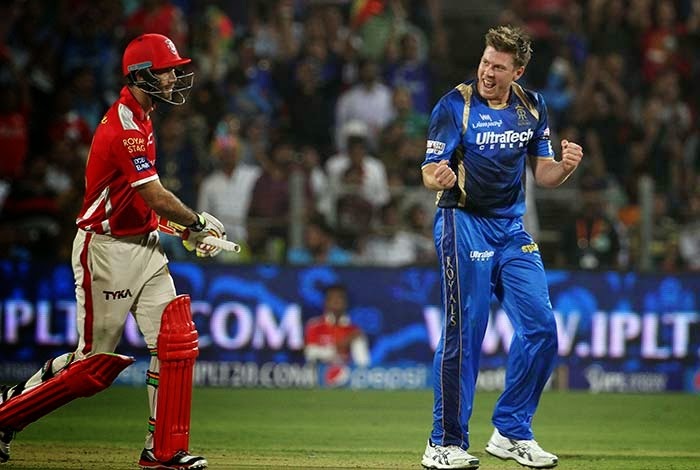 James Faulkner, the Man Of the Match, celebrates the wicket of Glenn Maxwell. Rajasthan get their IPL campaign of to a winning note.